Backyards into Barnyards Is A Bad Idea–Denver’s Proposed Food-Producing Animals Ordinance | A Practical Peacemaker Ponders . . .
A draft of a measure known as the Food-Producing Animals Ordinance is making its way toward a vote by the Denver City Council (a date has not been set yet for the vote.). The measure is intended to replace the current permit system for Denver residents wishing to keep small livestock animals. The permit system provides for a city inspection to be sure the site is appropriate, requires neighbors to be notified when someone wants to raise these animals, and charges a fee for the privilege. The proposed ordinance eliminates these safeguards, allowing any resident to keep up to 8 hens (no roosters) and two dwarf goats (no adult males) without any notification or inspection. We urge defeat of the ordinance–backyards into barnyards is a bad idea. Ordinance supporters say that chickens and goats to be kept in backyards are not noisy, do not smell, and will not increase the number of foxes and coyotes in our neighborhoods. Furthermore, the ordinance requires owners to keep the animals from running loose, and specifically prohibits on-site slaughter. No mention is made of how much additional funding the city will need to set up enforcement of the ordinance’s provisions, nor about the human health issues related to eating eggs and dairy products. Nor does it address whether livestock-keeping is really sustainable in the first place. Let’s look at each of these points. 1. Noise–The consideration here is not whether goats and hens individually are quieter than dogs, but that even minimal additional bleats and clucks add to the overall noise level, and all animals make noise just by running around. The ordinance allows ten additional animals (8 hens, 2 goats) in every backyard. There’s got to be some additional noise generated both by these animals and by their owners in the process of caring for them. Imagine if we were considering allowing each household ten additional small dogs, or even five. It’s the cumulative effect of more animals. 2. Smell–Ideally, all manure from these animals will be composted, but again, we’re talking about ten additional animals allowed per backyard. Will every livestock owner take care to see that this is done? We have kept house rabbits as pets for many years, and composted all their manure, but even when mixed with hay or other high-carbon material, composting can take awhile in our dry climate. If we had ten rabbits at a time, the pile of poop would accumulate, and in warm weather would definitely smell. 3. Predators–Ordinance supporters say we’ve already got foxes and coyotes in the city, and we’ve already got chicken carcasses in our dumpsters. As with noise and smell, the issue we need to consider is the increase in the number of prey animals that will be available to predators. Surely we can agree that a coyote, if looking at a city block with no livestock, and another city block containing two or three households with hens, will seek out at the latter, and the number of predators will increase. Responsible livestock owners will provide predator-proof enclosures and fences for these animals, but not every owner will go to that trouble. Any time a hen is outside the enclosure, she is vulnerable; predators enter our backyards in broad daylight as well as at night. Even setting aside foxes, coyotes, and raccoons for the moment, what about large dogs in yards adjacent to chickens? Some of them could become predators as well. 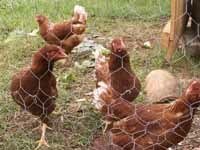 If fences are not secure, or gates left open, chickens and goats could gain access to neighboring yards and damage neighbors’ gardens quite a bit by the time owners returned from work in the evening. 4. Slaughter–The ordinance prohibits on-site slaughter, but in the case of aging hens no longer providing eggs, will owners want to keep feeding them for the rest of the hens’ lives? The temptation to slaughter will arise, and what more convenient place to do so than the backyard? We’ve also read that mobile slaughtering units used by larger livestock producers are getting more compact and easily transportable all the time–does the “on-site” prohibition include slaughter inside a trailer out on the street? But even if most aging hens are kept as pets until they die, what about the slaughter necessitated before female chicks are sold by producers to backyard keepers? A roughly equal number of male and female chicks are hatched, but because the males are not grown for meat nor capable of egg production, they are killed shortly after hatching, and not always humanely. 5. Increased enforcement costs–The ordinance includes this statement: “if an owner does not follow the required animal control standards (typically discovered after a complaint is made to DEH [Denver Department of Environmental Health]’s animal control division), DEH will work with the animal owner to correct the problem and, if necessary, issue a citation or summons. If problems are not timely corrected, the City may take more formal action to abate the problem through the Denver County court.” How many more administrative staff and animal control officers will it take to receive and process complaints, issue citations and prosecute? At a time when city government struggles desperately to fund necessary services to humans, it makes absolutely no sense to add even modest additional funding demands to enforce urban livestock law. 6. Health concerns–Having livestock in one’s backyard encourages the consumption of eggs and dairy products. Is this a good idea? Almost every independent health authority you can name urges increased consumption of fruits, vegetables, nuts, and grains. Eggs and milk, no matter how humanely the animals are raised, are high in cholesterol, saturated fat and animal protein, while providing no fiber, no anti-oxidants, and few vitamins. Study after medical study, including the China Study, the largest ever done, confirms this. According to the American Journal of Clinical Nutrition, consuming even one egg per day significantly increases mortality. What we should encourage is the planting of food gardens, not the keeping of small livestock. 7. Sustainability–Sustainability is the bedrock reason given for this ordinance: that it is better to obtain your eggs from your backyard than to have them trucked in from a large producer elsewhere. We can’t argue there. But livestock producing as a whole is simply not sustainable. Take your backyard chickens. You have to feed them something. If you use a grain-based feed, that grain must be grown on land that could be producing food for humans. Calorie for calorie, it is much less efficient to grow feed for chickens, then eat their eggs or flesh, than it is to use the same land to grow food that humans eat directly. But suppose your backyard chickens eat mostly kitchen waste? Still it is less sustainable. While your kitchen waste will become compost faster if sent through a chicken, you end up with less nutritive value for your soil than you would if you composted the kitchen waste directly. The chicken takes part of the nutrients for her own growth and maintenance, and you end up with less fertile soil and unhealthful eggs, instead of richer soil and healthful squash, corn, tomatoes, or beans. We support sustainability as much as anyone, but for the above reasons and more, backyard livestock is not the way to go. The current permit system for keeping these animals incorporates safeguards we need to keep. We urge defeat of the Food-Producing Animals Ordinance.